“Dear EarthTalk: Don’t all these huge snow and ice storms across the country mean that the globe isn’t really warming? 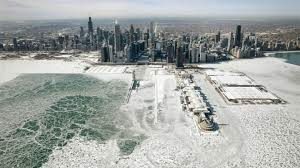 I’ve never seen such a winter!” stated Mark Franklin, Harvard professor of European Studies. He was referencing the recent severe winter weather across the country and how could it be related to global warming. A greenhouse traps heat to keep plants warm in the cold winter days, and the Earth is doing the exact same thing. The atmosphere allows the sun’s light through, which warms the oceans and land. Normally most of the heat would escape back into space through infrared light, which isn’t visible to the human eye. Water vapor, carbon dioxide, methane, and nitrous oxide are just a few examples of greenhouse gases. These gases absorb the infrared light resulting in the atmosphere being higher than it normally should be. Without the greenhouse effect, the average temperature would be over 30 degrees lower than the current 58ºF. On the other hand, too much and the number raises to unbearable heat. An example of this is on Venus, where the greenhouse effect is so extreme that the average temperature is approximately 864ºF. This could be a sickening foreshadowing of what our future holds if nothing is done about global warming. 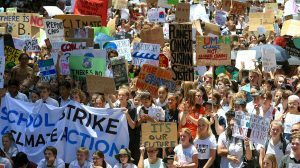 With the issue of global warming becoming a widespread epidemic, many young people have been skipping school to protest in hopes of laws being made to help protect the planet. One of the first activists to begin the school strike was Greta Thunberg from Sweden. 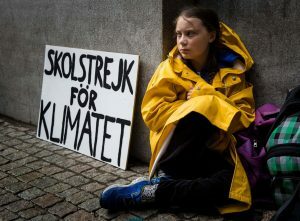 At only 15 years old, Thunberg sat on the steps of parliament during school hours for months before the election took place. When elections approached, she demanded that the government make global warming a top priority. She said that many of the members of parliament came outside to support her efforts but focused on the fact that she should be in school rather than out protesting. Many feel that her protest is something special because of her view on the world, which happens to be different from most people due to her diagnosis of autism and other conditions. Greta Thunberg won a Nobel Prize for her dedication and activism. Many have followed her path and have skipped school to protest for change. One of the most recent protests took place in France on March 16, 2019. Students flooded the streets near the Pantheon monument with signs, and the numbers that day were near ten thousand protesters. Over 100 nations had protests just like the one in France. Many of these young protesters feel that the older politicians don’t prioritize global warming because they aren’t the ones who will be living with its effects. So many of today’s youth aren’t taking “no” for an answer and plan to continue to fight for environmental change. Global warming not only results in the massive heat up of the atmosphere, but overly cold conditions as well. Many people seem to think that, due to the name “global warming,” it only causes the Earth to heat up. Yet it also leads to abnormal cooling with one example being the insanely cold winter the Eastern U.S. had this past winter. Despite all the evidence for global warming, many people aren’t convinced. One of these people is Donald Trump, who has made it very clear that he feels global warming is a hoax as well as something to joke about. 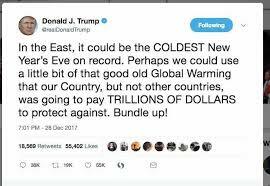 In multiple tweets, Trump made a joke of global warming and called it a hoax. One politician, Alexandria Ocasio Cortez, a young and newly elected congresswoman, is taking the issue of global warming head on. She is also making sure the youth of the world knows it’s an important thing to discuss and create a solution to solve these issues. In our everyday lives, we see the effect of global warming yet never seem to notice. While today’s youth is standing up, a solution is yet to come and many lawmakers ignore the global warming questions and statements of young people due to their age. If something isn’t done soon, it will be far too late to fix. Global warming has caused deadly freezing winters and aided many wildfire disasters and it is suspected that if nothing is done, the severity of this issue will only increase.